In order to benefit from Local Lead Machine’s vast array of robust features, you need a lead selling solution that tirelessly works for your best interest. This solution must deliver quality leads in real time to hungry lead buyers who designate their target prospects, with utmost accuracy. Delivering the RIGHT lead at the RIGHT time is crucial to the success of you your client. LLM excels on all fronts, providing a 100% automated lead deployment machine from handling money deposits to delivering the lead in ready to use format. All without the operator’s intervention. Just set up your lead selling solution one time and allow LLM to work it’s magic while you focus on cultivating new business partnerships that will pay you over and over. The life blood of any business is new leads and customers but when these new leads are hot and ready with wallets open, is when business owners need to strike. Think of it like a point of purchase item at your local food store. You have a small window to contact, educate and close these leads into paying customers. LLM has your best interest at heart. Our system makes sure these leads are handled with precise targeting and laser-fast delivery, assuring you of the best chances for a close. Old, antiquated methods for delivering leads is what your competition is doing now. It is time you harnessed modern automation and took your lead selling capabilities to the next level. 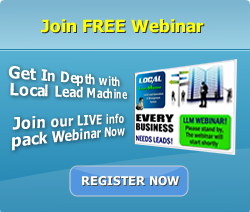 Again, Local Lead Machine IS the solution you have been looking for. Distribute Coupons and Collect Leads on behalf of a Local Business. Run your own group buy type system on auto pilot!